An almost native Tucsonan, Henry D. “Hank” Egbert arrived in the Old Pueblo at age two. He began his sports career on the soccer field at Roosevelt Elementary. While attending Roskruge Jr. High, under the coaching tutelage of Jerry Houck and Nobel Hiser, Hank spent his after-school hours watching the Tucson High Football “Badger” (including future All Americans Ted Bland and Earl Nolan) under the leadership of R.T. Gridley and C.L. McFarland. Later, as a Tucson High student himself, he was captain of Coach Gridley’s 1936-37 All American Hall of Fame team. His next assignment was coach of the 1941 University of Arizona Frosh Football Team. After World War II, Hank returned to Tucson High as line coach along with Jason “Red” Greer and Ken Pearson. Eleven years later, he moved to the newly opened Catalina High School where he held the unique distinction of being Head Coach, Athletic Director, Dean of Boys and Assistant Principal. Hank was also principal of Rincon High School and Sahuaro High School (where one of his great contributions was the selection of an outstanding coaching staff). 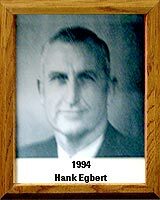 Hank served on the Board of the Lighthouse YMCA; worked as a lifeguard on Tucson’s westside; and became District Governor of Rotary International, encompassing all of Arizona and part of southern California.